Authors: Peale, S. J., Cassen, P. and Reynolds, R. T.
It’s eight days before Gloria Gaynor’s “I Will Survive” hits the top of the charts (or March 2nd, 1979). Iran’s monarchy is weeks gone, and the UK is moving steadily towards the general election in which Margaret Thatcher becomes Britain’s first female prime minister. Two years ago, the Voyager spacecraft were launched on trajectories that will allow them to carry out their primary missions: the study of the outer Solar System, in particular Jupiter and Saturn. Now, it’s just three days before Voyager 1‘s closest approach to Jupiter. In addition to studying the planet itself, Voyager I will observe Jupiter’s biggest four moons, which are also called the Galilean satellites. In order of increasing distance from Jupiter, these satellites are Io, Europa, Ganymede and Callisto. Their orbits trace out a unique path along the sky: the three innermost satellites are in a 4:2:1 orbital resonance. That means for every four orbits Io makes, Europa makes exactly two orbits and Ganymede makes exactly one orbit, as illustrated to the right. The paper that was published on March 2nd, 1979 in Science is a prediction for what the Voyager spacecraft might see on Io based on the orbital motions of these three satellites. Io orbits synchronously, that is, the same face is always facing Jupiter. The difference in gravity between the side of Io closest to Jupiter and the side farthest away creates a “tidal bulge,” a distortion in the shape of Io. Io is also on an eccentric orbit, which is a result of two factors. First, Io’s orbit is naturally a bit eccentric. Second, gravitational interaction with the other Galiliean satellites is ramping up (or “forcing”) Io’s eccentricity. However, in this case, Io’s natural eccentricity (or “free eccentricity”) is very low. This means that 1) gravitational interaction with its neighboring moons is primarily responsible for Io’s eccentricity, and 2) its eccentricity won’t get damped with time, because the forcing mechanism remains. Tides on Io dissipate heat. This is because as tides distort a moon, rock is stretched and compressed. As you can imagine, there’s friction when you stretch rock, and friction releases some of the satellite’s orbital energy as heat. If Io’s eccentricity was all natural eccentricity, a happy medium would be reached: Io would be rotating on a synchronous, near-circular orbit, with a tidal bulge of roughly consistent size and shape pointing towards Jupiter. This is what’s happened with the Earth/Moon system; if it were also true for Io, the tidal distortion would stay roughly the same and not much heat would be dissipated. However, Io’s eccentricity is being ramped up by the proximity of its neighboring satellites. When it’s closer to Jupiter, the tidal effect is stronger and Io is more distorted. When it’s farther from Jupiter, the tidal effect is weaker and Io is more spherical. This means that each orbital period (every 1.8 days!) Io is being stretched – by as much as 330 feet! – then allowed to relax back to a less distorted shape. That leads to a lot of friction, a lot of energy being released, and a lot of heating in Io’s interior. Peale et al. show that the amount of heat dissipated by tides on Io means that it should have a molten core (in contrast to the Moon, which is roughly the same size as Io; without any energy being added to the Moon, it has solidified over time). How do they show this? First, they use the orbital motions of the inner three satellites to calculate Io’s eccentricity. Then they calculate the heat dissipated by tides, which increases with eccentricity. For this calculation, they assume that Io is similar in composition to our Moon. Noting that more energy will be dissipated in Io’s core than near its surface, they calculate that Io’s interior is being heated at a rate ten times the rate at which the Moon is being heated, resulting in the melting of Io’s core unless heat is removed from its interior rapidly enough to prevent this. However, when the authors determine the rate at which heat is transported to Io’s surface, where it is then radiated away into space, they see that it is not sufficient – Io’s core should be melted. Voyager I image of Io. NASA/JPL. The authors go on to discuss the implications for a molten core. They point out that with a liquid interior, the solid outer layer is expected to be more strongly heated than if the entire planet were solid because a thinner outer layer is more strongly deformed by tides than a thicker one. This can lead to a runaway melting scenario: since the outer shell gets very hot, it melts material at the core boundary. Now the outer shell is thinner and so it is further deformed and gets hotter, melting yet more material near the core. The runaway melting effect is limited by how fast heat is removed from Io’s surface, so we don’t end up with a completely liquid planet. What might we expect to see on Io when it is imaged by Voyager I in just a few days? Peale et al. suggest “widespread and recurrent volcanism;” as on the Earth, a liquid interior allows magma to erupt from the surface. Perhaps magma explains the brightening events that had been seen on Io. When Voyager I flew by Io, it caught an eruption in action, spectacularly confirming the predictions of this paper. Two plumes can be seen in the image above, one in the upper left and the other along the day/night terminator. 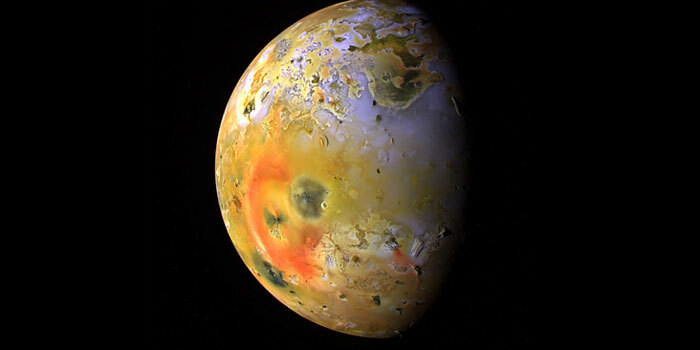 To end the story, here is an enhanced-color image of Io taken by the Galileo spacecraft in 1997. Red and dark spots indicate recent volcanism, and you might note the prominent red ring, which marks the volcano Pele. Do you see the dark spot on the upper right edge of Pele? It wasn’t there five months earlier, and on one orbit, the satellite saw a 75-mile high plume rising from that spot. Simulating the unseen: learning about Jupiter’s unknown impactor through simulations AU Mic through new ALMA glasses Hold on to Your Moons! Ice, Atmospheres and the Grand Tack Stuff Between the Stars: Gas, Dust, and… Asteroids? I remember reading the article in the Physics library at Berkeley, and thinking “well maybe” although I was impressed by the clever analysis. The imaging team on Voyager had heard about the paper but since they were swamped with preparations for the flyby, they didn’t have time to do anything about it. One of the photo techs, Linda Morabito, if I remember correctly made the discovery. She thought the first volcano visible against limb was a lens flare, but when she found a second one she realized the sun was in the wrong position. She took it to her supervisor and the rest is history. I suspect the video of the press conference she gave describing the discovery is on the web somewhere, it certainly should be. That is really cool, thanks for sharing! If anyone happens across the press conference video (I haven’t found it yet), let us know!